8 Health Benefits of Hazelnuts | Eat This! Hazelnuts come from the tree of the same name and perhaps are most famously known these days for their use in confections such as praline, chocolate truffles or Nutella. The delicious flavor of the hazelnut is also popularly added to coffee and liqueurs and the oil from the nut can be used for cooking. The country that produces the most hazelnuts in the world is Turkey, followed by Italy and the US. Here are 8 health benefits of hazelnuts. Hazelnuts are rich in unsaturated fats, the kind that are actually good for the heart. Much of this fat is oleic acid, shown to lower LDL “bad” cholesterol and raise the “good” HDL kind. One cup of hazelnuts contains almost half of our recommended daily amount of magnesium, a mineral that regulates calcium levels in muscles. When calcium levels are high the heart may contract, and beat irregularly. Proper amounts of magnesium keep the heart from overexerting itself by promoting healthy rests between contractions. Studies have found that the alpha-tocopherol type of vitamin E hazelnuts are so rich in may cut the risk of bladder cancer in half. Additionally, the manganese so abundant in hazelnuts goes a long way in protecting the body from cancer. Manganese is a constituent of an antioxidant enzyme produced in the mitochondria of the cells to protect the body from cancer. Magnesium plays an important role in regulating the amount of calcium that goes into and out of the cells of the body. The proper amount of calcium at the proper time encourages muscle contraction, and allows the muscles to relax when they’re not needed. This avoids muscle tension, soreness, spasm, cramps and fatigue. According to one Italian study, higher magnesium levels also increased the strength of the muscles. One cup of hazelnuts contains 86% of the recommended daily allowance of vitamin E. Vitamin E has been proven to protect skin from the harmful effects of ultraviolet radiation, such as skin cancer and premature aging. About two thirds of the magnesium the body uses goes towards building the structure and strength of the skeletal system. Magnesium is a key mineral in the makeup of the bones, and is so important that the body stores extra magnesium on the surface of bones to be used in case of an emergency deficiency. Hazelnuts are also rich in manganese, a mineral essential for the growth and strength of bones. Post-menopausal women are often deficient in manganese and can benefit from its ability to increase the density of bone, and fight osteoporosis. The nervous system needs amino acids in order to function, and amino acids require vitamin B6. Hazelnuts are rich in vitamin B6. Moreover, vitamin B6 is necessary for the creation of myelin, the insulating sheath of the nerve that increases the speed and efficiency of electrical impulses, allowing the nervous system to operate optimally. What’s more, vitamin B6 is instrumental in the synthesis of the neurotransmitters serotonin, melatonin, and epinephrine. Hazelnuts are rich in manganese, which is an enzyme activator and a catalyst in the synthesis of fatty acids and cholesterol. It also promotes protein and carbohydrate metabolism. The high content of fiber in hazelnuts assures regular movement of food and waste through the digestive tract, distributing the burden of work evenly along the way and promoting the proper balance of chemicals and microorganisms necessary for a healthy digestive system. Hazelnuts are rich in vitamins B1 (thiamin), B2 (riboflavin), B3 (niacin), B5 (pantothenic acid), B6 and B9 (folic acid). We rely on the B vitamins to dismantle proteins, fats and carbohydrates for us, thereby providing us with the energy we need to function. The B vitamin complex is used throughout the body, particularly for the health of nervous system. The B vitamins assuage stress, anxiety and depression. They also improve the memory and are necessary for the production of neurotransmitters such as serotonin. B9 aids hormone synthesis and riboflavin is necessary for healthy red blood cells. Niacin improves skin health ensures the normal function of the digestive and nervous systems. Some B vitamins help build and repair damaged DNA. 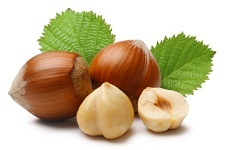 1 Comment on "8 Health Benefits of Hazelnuts"
Wow, this site is awesome, I look at health sites frequently and learned THINGS I never seen before about different nutrients. I can’t wait to look up more foods. I truly believe food source are the best way to keep our bodies healthy. I am sending a link to my sister, keep up the good work.